(Sentinel Photo By Kent Jones) Hurdle races were an area of strength for both Le Mars teams on Thursday including the boys shuttle hurdle race depicted here. The top Le Mars team won the race with a time of 1:06.73. ORANGE CITY — The Le Mars Community track and field teams hit the track at the Unity Christian Early Bird Meet held on Thursday. The boys team set two meet records of the three records broken on the day. Ben Wadle won the 400 meter hurdles with a time of 58.86 seconds as he becomes the only athlete to post a time under a minute at the meet with the former best mark being 1:00.67. The 4x100 team concluded a tenth of a second under the old meet record with a time of 45.99 seconds. Another Le Mars win came in the 100 meter dash as Anthony Lamoreux clocked a time of 11.60 seconds. The Bulldogs had four of the top six times with Dylan Rasmussen third in 11.95 and Tyler Ferguson and Brandon Kass ending in fifth and sixth. Cody Ott was 11-hundredths back of the winning 200 time as Carter Schiebout of Unity won in 25.08 seconds. 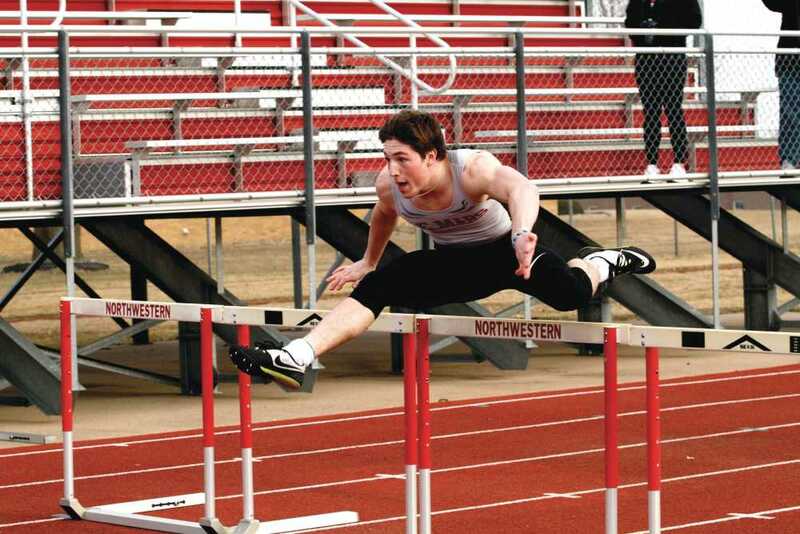 Along with his record-breaking 400 hurdle performance, Wadle added a win in the 110 meter high hurdles with a time of 16 seconds flat. Le Mars was the only school to compete in the event with Reece Spieler taking second followed by Carter Arens. The hurdle success continued in the shuttle hurdle relay as the top Le Mars team won the event with a time of 1:06.73. The other relay win for the Bulldogs came in the 4x200 race where the top Le Mars team ended in 1:36.24 which was six seconds faster than the next-best team. 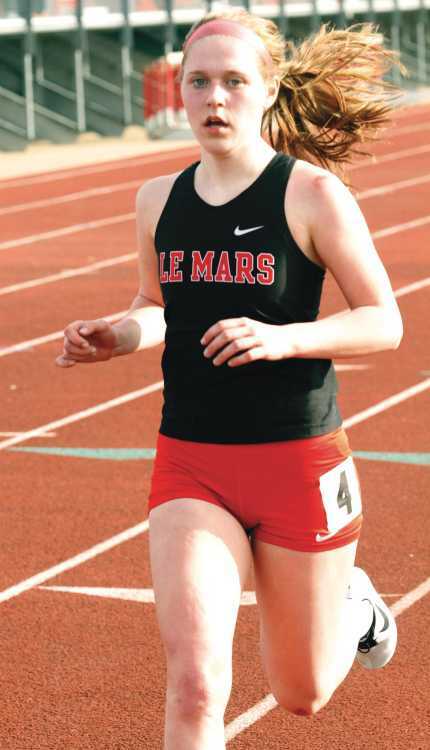 Le Mars added second place showings in the 4x800 and both medley relays. Brandon VanderSluis won the discus with a throw of 142-10 which was over 12 feet better than the next-best throw. He added a second place shot put mark of 42-06. In the wheelchair events, Kadin Woodard came away with four wins. He posted a time of 20.70 in the 100 meters, 40.39 in the 200, 1:28.63 in the 400 and had a throw of 16-03.75 in the shot put. Just like the boys, the Lady Bulldogs found success in the hurdle events. Kady Leusink and Karlee Schiff took the top two spots in the 100 meter hurdles. Leusink won with a time of 18.05 seconds while Schiff was just over half a second back of that time. Schiff added another silver in the 400 hurdles as she ended in a time of 1:13.84. The shuttle hurdle team nosed out a win over MOC-Floyd Valley with a time of 1:15.25 which was 0.36 better than the Lady Dutch. The Lady Bulldogs had one other relay win aside from the shuttle hurdle which came in the 4x100 as the team sprinted to a 55.57 time to win by over two seconds. The team finished as runners-up in the 4x400, 4x800 and sprint medley relays. Along with leaping over hurdles, Schiff also leapt over the bar in the high jump to take the top spot with teammate Shaniah Temple taking second as both cleared 4-08. (Sentinel Photo By Kent Jones) Maddie Hurt runs the 3000 meter race which she won in a time of 12:15.42. She also placed second in the 1500 with a time of 5:32.83. Maddie Hurt secured a win in the 3000 meter race as she finished in a time of 12:15.42. Hurt was just over a second behind winner Emily Haverdink of MOC-Floyd Valley in the 1500 with Hurt ending in 5:32.83. Le Mars easily had the top two times in the 400 with Chloe Calhoun and Katie Cunningham taking the spots. Calhoun finished in 1:04.47 which was just over a second faster than her teammate. Sarah Meis picked up second place in the 800 with a time of 2:48.81 as Western Christian’s Macay Van’tHul won in 2:34.72. It was another second place result in the 200 with Bulldog runner Brynlie Daale edged by just 0.06 of a second by Unity’s AJ Schrock who won in 28.96 seconds. Lilly McNaughton hit the sand at 14-11 in the long jump which was good enough for second place behind Unity’s Mikayla Turek who won with a meet record 16-02 distance. The team’s other runner-up finish in the field events came from Leah Volkert in the discus as she threw a distance of 90-11. The Bulldogs will next compete at the University of South Dakota on Monday.